Paige Gaynier of Delphos St. John’s put sup a shot against New Bremen’s Abbi Thieman during Thursday night’s Midwest Athletic Conference game at Robert A. Arnzen Gymnasium in Delphos. Melanie Koenig of Delphos St.John’s puts up a shot against New Bremen’s Kayla Bergman during Thursday night’s Midwest Athletic Conference game at Robert A. Arnzen Gymnasium in Delphos. 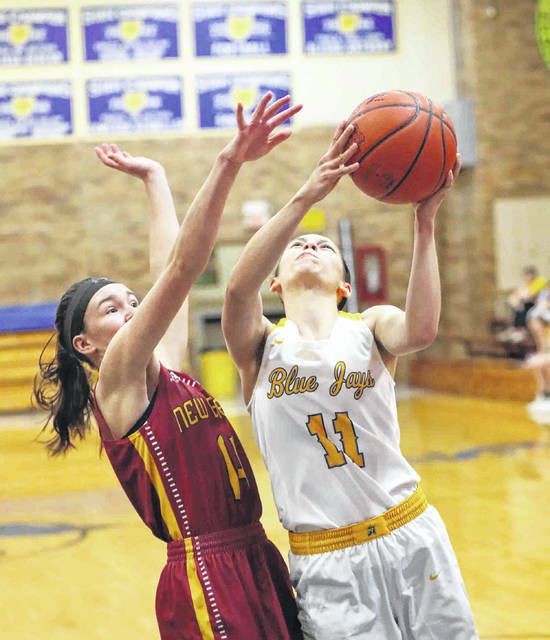 DELPHOS — Delphos St. John’s sophomore Melanie Koenig said she felt rebounding would be a key against New Bremen. So Koenig made sure to do her share on the boards. 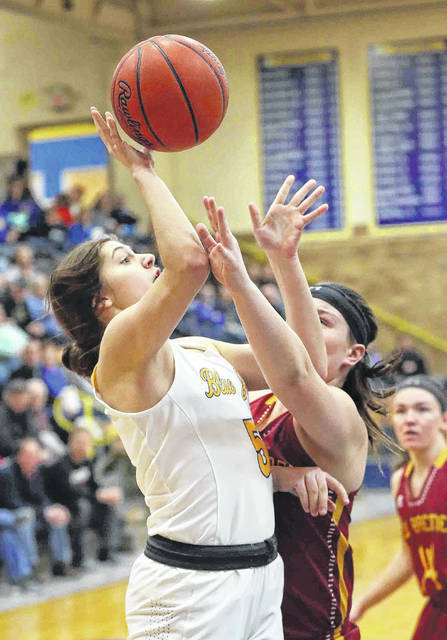 Koenig had a double-double to help St. John’s post a 62-56 Thursday night girls basketball victory against New Bremen at Robert Arnzen Gymnasium. The 5-foot-8 Koenig had 14 points, 12 rebounds and played standout defense in the team’s man-to-man press. She also hit 10 of 12 at the foul line, including dropping 5 of 6 in the final quarter. Sophomore Paige Gaynier had 15 points with three 3-pointers for the Blue Jays. Betty Vorst had 13 points and four rebounds. Hannah Will had nine points and two 3-pointers. St. John’s is 12-6, 4-4 in the MAC. New Bremen is 12-6, 3-4 in the MAC. Madison Cordonnier, who averages 10 points per game, led New Bremen with 22 points with three 3-pointers. Hanna Tenkman had eight points and eight rebounds. Kelly Naylor, who leads the team with 11 points per game, had five points. Elli Roeterman had nine points. With New Bremen clogging the driving lanes to the basket, St. John’s had some open looks at the 3-point line. The Blue Jays responded by hitting 9 of 22 on 3-pointers, including 4 of 6 on threes in the final quarter. St. John’s went out to a quick 10-2 lead and led 15-8 after the first quarter. But the second quarter was owned by the outside shooting of the Cardinals, who led at the half 31-26. St. John’s used a zone press in the third quarter and a man-to-man press in the final quarter for its second-half comeback. That seemed to take the Cardinals out of their offensive flow. New Bremen ended up with 19 turnovers. Defensively, Koenig held Cordonnier to six points in the second half. The Jays’ Taylor Zuber held Naylor scoreless until the final quarter, when she scored all five of her points. “Their girls are long and athletic and their length got to us a little bit,” Burden said. Will and Gaynier both canned 3-pointers in the first few minutes of the fourth to get the Blue Jays within 51-50. Koenig’s two free throws gave the Blue Jays a 52-51 lead with 4:16 left. Abbi Thieman’s driving layup for New Bremen pushed the Cardinals back in front 53-52 with 4:01 to go. Then it was Aubrie Friemoth sinking her second 3-pointer of the game and the Blue Jays took the lead to stay 55-53 with 3:45 to go. Zuber’s 3-pointer pushed the Blue Jays’ lead to 58-54 with 2:01 left. New Bremen outscored St. John’s 19-5 to start the second quarter to pull out to a 27-20 lead. Leading the way was Cordonnier, who was 3 of 3 on 3-pointers in the second quarter. She had 12 in the second quarter and 16 at the half. “In that second quarter we told them to run the floor and we ran the floor and got some easy buckets,” Burden said. “Those weren’t there in the second half.’’ Both teams had 29 rebounds. St. John’s shot 38 percent from the field, but hit 41 percent on threes. New Bremen hit 52 percent from the field and was 5 of 13 on threes. This entry was tagged delphosstjohns, newbremen. Bookmark the permalink.